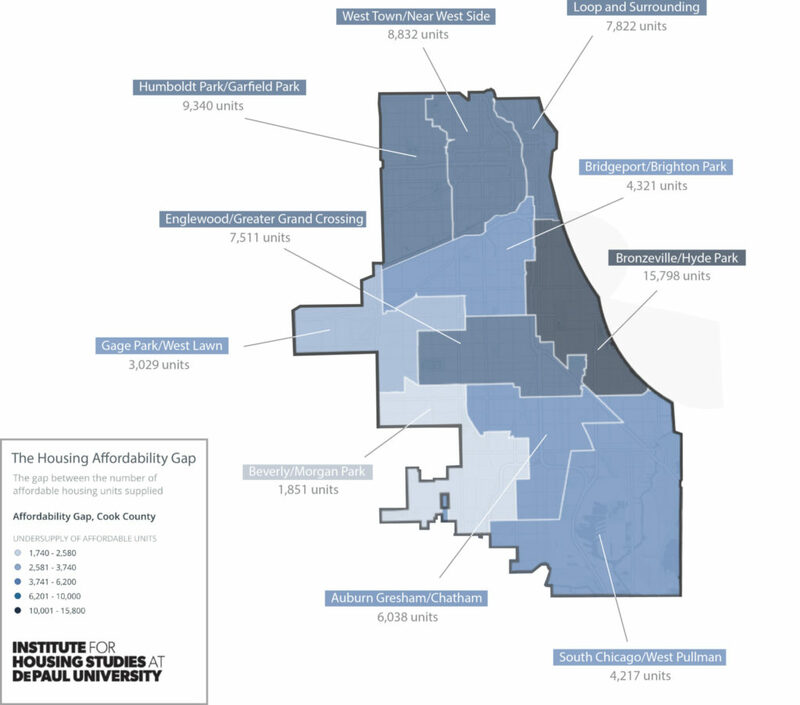 Last week, the Institute for Housing Studies (IHS) at DePaul University released its newest annual report on the state of rental housing in Cook County. While the report shows small changes within individual neighborhoods, the overall trends across the county are largely unchanged from previous years: less traditionally affordable housing, high levels of cost-burdened tenants, and a large gap between the supply and demand of affordable housing. Worryingly, the report also shows that the stock of two-to four-unit buildings across the city continues to remain below its historical level. That’s important because two-to-fours, as they’re commonly called, have long been an important source of affordable housing in the city. But after the financial crisis, foreclosures of two-to-fours in neighborhoods on the South and West Sides increased dramatically. For example, a 2012 report from IHS showed that forty-three percent of Englewood’s two-to-four unit buildings went into foreclosure from 2005 to 2011. That was the highest share of foreclosures in the city, but statistics from other South Side neighborhoods are almost as jarring: forty percent in Burnside, forty-one percent in Washington Park and Woodlawn. The loss of traditionally affordable housing stock goes hand in hand with another continuing trend: the high percentage of rent-burdened households in Cook County. Any household that pays more than thirty percent of its income in rent is defined as rent-burdened, while those who pay more than half their income are severely rent-burdened. In 2016, 87.5 percent of households that made less than thirty percent of the area median income in Cook County (about $77,000) were rent-burdened, and seventy-four percent were extremely rent-burdened. In other words, a large majority of the poorest households in the city and suburbs are facing a continuous, monthly affordability crisis. What about taking Lawndale (north & south) as a separate area into consideration? Hi Dolores—the areas outlined on the map are Public Use Microdata Areas that are determined by the U.S. Census Bureau, and is how the data that the Institute for Housing Studies used was broken down. You can read more about their methodology here.